More than four decades after Roe v. Wade legalized abortion nationwide, most Americans (57%) are supportive of legal abortion, according to a 2017 Pew Research Center survey. But a substantial minority (40%) says abortion should be illegal in all or most cases, and within some U.S. denominations and religious groups, this figure is much higher. For instance, most Jehovah’s Witnesses (75%) and Mormons (70%) say abortion should be illegal in all or most cases, according to the 2014 Religious Landscape Study, a survey of more than 35,000 Americans in all 50 states. 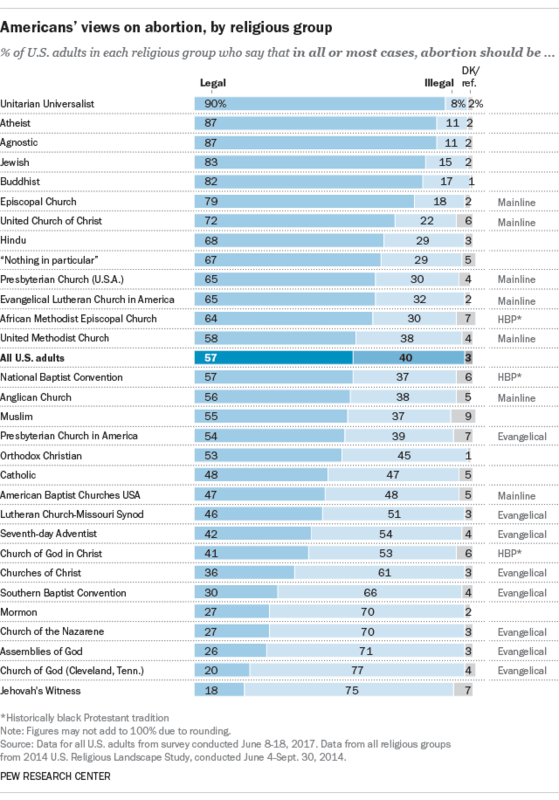 The same holds true for members of some evangelical churches, including the Pentecostal denominations Church of God (Cleveland, Tennessee) (77%) and Assemblies of God (71%), as well as America’s largest evangelical denomination, the Southern Baptist Convention (66%). Indeed, among all those who are part of the evangelical tradition, nearly twice as many say they oppose legal abortion as support it (63% to 33%). By comparison, only 35% of those who are part of the mainline Protestant tradition say abortion should be illegal in all or most cases, with 60% in support of keeping abortion legal. Members of the Episcopal Church (79%) and the United Church of Christ (72%) are especially likely to support legal abortion, while most members of the Presbyterian Church (U.S.A.) and the mainline Evangelical Lutheran Church in America (65%) also take this position. Unitarian Universalists (90%) and American Jews (83%) in the 2014 survey were much more supportive of legal abortion than the general population. And most people who have no religious affiliation – particularly atheists and agnostics (87% each) – also support abortion rights. Among those who do identify with a religion, the majority view about abortion among members of a particular group often mirrors that group’s official policy on abortion. This is the case with the Church of Jesus Christ of Latter-day Saints (the Mormon church) and the Southern Baptist Convention – both churches oppose abortion, as do most members of those churches. And the Presbyterian Church (U.S.A.), Unitarian Universalist Association, and Reform and Conservative Judaism, for example, all support abortion rights, in line with most of their adherents. There are, however, cases where the views of a church’s members don’t align with its teachings on abortion. For instance, while the Roman Catholic Church is an outspoken critic of abortion, U.S. Catholics were divided on the issue in the 2014 survey, with 48% supportive of legal abortion and 47% opposed. A closer look at Jehovah’s Witnesses living in the U.S.